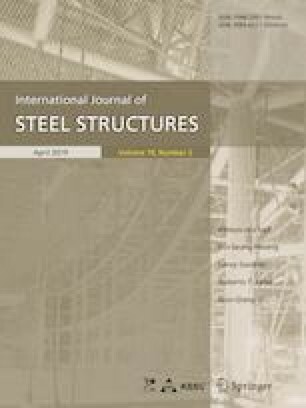 This paper presents a series of bending tests performed on G550 high strength cold-formed steel Z-section members under pure bending and moment gradient. In tests, failure resulted from distortional buckling or the interaction between local and distortional buckling. The test results indicated that the bending strength for moment gradient is greater than that for pure bending. The increasing magnitude is closely bound up with the member’s buckling modes since moment gradient has a significant effect on distortional buckling but has a minor effect on local buckling. Moreover, finite element analysis was applied to verify the tests and the numerical results agree well with test data according to bending strength and failure modes. Furthermore, the test results were compared with the Direct Strength Method (DSM) formulas stipulated in AISI (2016), and it is found that the DSM provides a good agreement with the bending strength for distortional buckling but provides unconservative predictions for the bending strength for interaction between local and distortional buckling. This research is financially supported by the Fundamental Research Funds for the Central Universities (2572017CB01), the Natural Science Foundation of Heilongjiang Province (E2015056) and the China Postdoctoral Science Foundation (2015M581411), which are gratefully acknowledged.